Spreadsheets become a canvas in the hands of Tatsuo Horiuchi. While most people use Microsoft Excel to organise their data into neat rows and columns, Japanese artist Tatsuo Horiuchi has discovered there's more to the spreadsheet software, and has turned it into a stunning digital art medium. The 77-year-old artist decided to start stretching his creative muscles as he came close to retirement. However, his thrifty nature ruled out the possibility of using traditional mediums, or the likes of Adobe Creative Cloud. So instead of paint brushes and pencils, or a drawing tablet, Horiuchi turned to Microsoft Excel because it ticked all the boxes his creative streak needed: it came free with his computer, and he already had it. Other artists (such as Hal Lasko, then aged 97) have already used the equally cheap and convenient computer tool MS Paint to express themselves, but Horiuchi found that the data management software offered more creative flexibility. Horiuchi has been impressing people with his Excel masterpieces for years now. In fact, his first taste of widespread attention came in 2006 when he wowed the judges at an Excel Autoshape Art Contest. From here he went on to create work that has been acquired by the Gunma Museum of Art. But a recent video interview on Great Big Story has catapulted him into mainstream attention. Watch it below. We're blown away by the level of detail in these digital pictures. Just take a look at the image at the top of this article, titled The pond of the plateau enclosed in green (the shark pond) and the woman of the parasol. 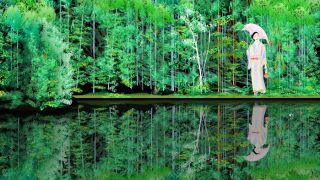 Not only has Horiuchi created the illusion of dense foliage, but he's mirrored this perfectly in the water's reflection. On one of his numerous online domains, Horiuchi gives an indication of how difficult the Excel medium can be when he talks about the creation of this piece. "This painting is a work of pain," he reveals through a Google-translated caption. "I cannot open it even if I save the drawing due to insufficient capacity. When examined it is about 288 MB."